Right off the bat, the price of the Silverlit GT Champion Super Drift sets left me worried about their quality & performance. For $30 you're getting not only a true four-wheel-drive RC car in 1/18th scale, but also a second complete body, and a second complete set of different tires. The construction quality actually feels very good, though, and the bodies seem thick & durable, with good detailing, though the decals say weird things. The tires that are pre-installed on the car are hard, plastic slicks designed to offer very limited traction to enable drifting. The second set is made of a very soft rubber to make sure the car doesn't drift for traditional "grip" driving. I started my test of the Silverlit GT Champion Super Drift car indoors on a smooth floor where I could see how well it does at the main thing it's made for -- drifting! It did not disappoint. The car has very balanced handling. Though it lacks proportional steering & throttle control, it can be made to drive a tightening or widening radius of drift by simply alternating the throttle trigger between on & off. To really tighten up a turn or to pull off a quick 180, you can tap reverse briefly and it will act like an "e-brake" in a real car, whipping the tail end around rapidly. You can pull off J-turns, figure 8s, and donut spins. The only problem I encountered, as you'll see in the video, was that every now & then the car would start to go on its own, when I wasn't even touching the controls. It did this in several completely different locations (different cities even), so it was not caused by radio interference from just one place. It may be an issue with poor precision around the neutral point on the radio trigger, as touching the trigger in the direction the car is moving on its own, then letting go, seems to get it unstuck. At my second test site, I switched to the soft rubber tire set, and also swapped out the body just for kicks. In grip configuration, The GT Champion Super Drift car accelerated rapidly and stuck to the ground in turns like it was riding on glue. The motor is fast enough to make the car very exciting to control, and the steering is extremely responsive, acting immediately when you ask it to.There was literally nothing about the handling on the rubber tires that I felt needed to be improved. What a surprise. 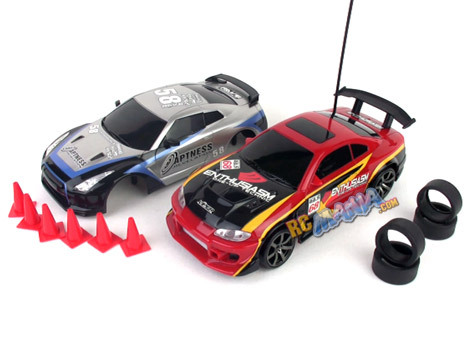 Seeing its price, I thought the Silverlit GT Champion Super Drift car would be, at best, a cool little toy for younger kids to drive around the kitchen or patio. Any and all expectations were exceeded with excellent, controllable, real drifting action, and fast, agile "grip" driving with a simple tire change. The occasional radio glitch I encountered definitely keeps this product from getting an A+, though in fairness, I do not know whether this is a rare problem or common to all units.